My dear countrymen, Namaskar. Of late, News of abundant rainfall has been steadily coming in. At places, we are hearing of rising concerns on account of excessive showers; at some places, people are anxiously waiting for the rains to begin. The vastness and diversity of India is such, in fact, at times even rains play hide & seek through partiality laced likes & dislikes. But why should we blame the rains! After all it was humankind that chose the path of conflict with Nature and consequently earned her periodic wrath. And that is why it becomes our collective responsibility... Let us be lovers of nature, protectors of Nature, conservers of Nature… and thus, ensure spontaneous balance in her myriad bounty. Come to think of it, recently an incident pertaining to a natural disaster attracted global attention, leaving every heart & mind perturbed. All of you must have watched it on T.V... in Thailand a team of 12 teenaged football players and their coach went on an excursion to a cave. Usually it takes a few hours to enter and exit that cave. But destiny had different plans that day. Barely had they entered deep into the cave that a sudden heavy downpour caused water logging at the inlet of the cave. Their exit was completely blocked. Not able to find a way out, they perched themselves a top a mound inside the cave; not for a day or two, but an entire 18 days. One can only imagine the predicament of these teenagers in the face of death, where every second was fraught with danger. On the one hand they were struggling against all odds; on the other, the world over, humanity joined hands in expressing the noblest & the most righteous of human virtues. The world over, people prayed for the safe & secure exit of these children. No stone was left unturned to trace their where abouts, their well-being and their rescue. Their timely evacuation was of a prime concern, since the heavy rains would have delayed rescue-attempts by a few months. Anyway, the good news of their safe exit led to a sigh of relief, a sense of inner calm. But I feel like viewing the entire sequence of events from another perspective, i.e, how the operation was conducted! The sense of responsibility & commitment, prevailing at every level was astonishing. The government, their parents, family members, media, citizens of that country, each one of them displayed an awe-inspiring sense of peace and patience. All of them came together as a team to accomplish their mission. I feel the self-control exercised by each one of them in conduct is worth understanding and emulating. It is not that the parents were not aggrieved, it is not that the mothers' eyes had ceased to be moist. Their patience, their restraint, in fact the calm composure exercised by the entire society is commendable & worth following. During the operation, a sailor from Thailand Navy sacrificed his life. The whole world is bewildered at the way they held on with courage and patience, without losing hope, despite the odds against them in the water-logged dark cave. This proves that when humanity stands together, it creates wonders. What is certainly required is focusing on your goal with a calm & steady demeanour and the will to strive. Usually, the months of July and August are very important for farmers and the youth. This is the time which is peak season for colleges. Like Satyam, Hundreds of thousands of youth leave schools to join colleges. Whereas February and March get consumed in exams, papers and answers, April & May are meant for enjoying vacations, followed by results and thereafter, shaping a course for one's life through career choices. July is the month when the youth step into a new phase of life, where the focus shifts from questions and veers towards cut-offs. The attention of students steers from home to hostel. Students submit themselves to the tutelage of Professors vis a vis the shadow of their parents. I firmly believe that my young friends must be enthusiastic & happy on the commencement of their college life. Leaving home for the first time, moving out of one's village, coming out of a protective environment amounts to taking charge of the course of one's life. This multitude of young people leave their homes for the first time to chart a new direction for their lives. Some students might have joined their respective colleges and some must be about to join. All I would like to say to you is 'Be calm, enjoy life, seek inner happiness in life. There is no alternative to books, one has to study, yet one's bent of mind should be towards discovering new things. Old friends are invaluable. Childhood friends are precious, but selecting, making & maintaining new friendships is a task that requires immense prudence. Keep learning something new, such as newer skills and languages. Young people who leave their homes for the sake of studies should discover their new places, know more about the people, language, culture & tourism facets related to them. My best wishes to all the young people about to begin a new innings. Referring to the college season reminds me of someone I saw in the news recently... how Asharam Choudhury a student from an extremely poor family in Madhya Pradesh overcame life's many challenges to achieve success. In his maiden attempt, he cracked the Entrance exam for MBBS at AIIMS, Jodhpur. His father earns his daily bread by waste-picking. I congratulate him on his success. There are many such instances of students from deprived families who, through sheer determination & perseverance overcame all odds and stood out to be beacons of inspiration to others. Examples such as Prince Kumar of Delhi, whose father is a DTC bus driver, Abhay Gupta of Kolkata who studied on foothpaths under street lights, Bitiya Afreen Sheikh of Ahmedabad, whose father drives an auto rickshaw, Nagpur's daughter Khushi, whose father is a school bus driver, Karthik of Haryana, whose father is a watchman or Ramesh Sahu of Jharkhand, whose father is a brick-kiln labourer or Gurgaon's divyang angel Anushka Panda, who suffers from a hereditary disorder called spinal muscular atrophy... all of them overcame each & every obstacle through their firm resolve and zeal, attaining success for the world to see. If we look around, we can see many such examples. My dear countrymen, a few days ago I happened to glance through a news item, it said- "Two youths make Modi's dream come true". On reading further, I came to know how our youngsters put in efforts to transform the lives of the common man by making smart and creative use of technology. It so happened that once I was interacting with Indian youth in San Jose town of America hailed as a Technology Hub. I had appealed to those young people to think over how could they use their talent to India's benefit and do something in that direction whenever they found time. I had made an appeal to change brain-drain into brain-gain. Two IT Professionals from Rae Bareilly Yogesh Sahu ji and Rajneesh Bajpayee ji accepted my challenge and made a unique attempt. With their joint efforts, Yogesh ji and Rajneesh ji have developed a SmartGaonApp by utilizing their professional skills. This App is not only connecting the villagers with the whole world but now they can obtain any information on their own mobile phones. Residents of the village Taudhakpur in Rae Bareilly, village Chief, District Magistrate, CDO and every one joined in to create awareness amongst the masses. This App is actually bringing in a Digital Revolution in the village, with the help of this App, it has since become easier to record, track and monitor developmental work being done in the village. This App contains phone directory, News section, events list, health centre and information centre of the village. This App is very useful for the farmers and the grammar feature of the App and FACT rate among the farmers functions like a market place for their products. If you look into this incident minutely, one thing will strike you and that is the young man living in America adhering to that country's life-style and ideology, who left India many years ago but, knows the finer details about his village, knows about the challenges and still is emotionally attached to his village. This seems to be the reason as to how he could develop this App which is most suited to needs of the village. A sense of belonging towards the village and towards one's roots and also a spirit to show and do something is naturally there in each and every Indian. But, sometimes because of time, sometimes because of distance and at times because of situations that spirit gets faded but just with a touch of a tiny spark, everything re-emerges which takes one back to old memories. We should also check if such a thing has happened in our case too whether circumstances, situat-ions, distances have made us alien, whether dust has gathered over our determinations. Santoshji, many - many thanks for your phone call. Actually, Pandharpur Wari is an amazing journey in itself. Friends, Ashadhi Ekadashi, which fell on 23rd July, is celebrated as a day of grand transformation of Pandharpur Wari. Pandharpur is a holy town in Solapur district in Maharashtra. About 15-20 days before Ashadhi Ekadashi warkari or pilgrims start the Pandharpur Yatra on foot. This yatra (journey) is known as Wari and lakhs of warkaris join this. Wooden foot wear or padukas of great saints like Saint Gyaneshwar and Saint Tukaram are placed in a palki and pilgrims begin their pilgrimage chanting "Vitthal-Vitthal". Pilgrims go to have a darshan of Vitthal who is also known as Vithoba or Pandurang. Lord Vitthal safeguards the interests of the poor, the deprived ones and the ones who are suffering. People from Maharashtra, Karnataka, Goa, Andhra Pradesh, Telengana have deep devotion and respect for Vitthal. Visiting Vithoba temple in Pandharpur and its grandeur, beauty and spiritual bliss is a unique experience in itself. I request the listeners of "Mann Ki Baat" to visit Pandharpur Wari at least once, whenever they get a chance. Innumerable saints like Gyaneshwar, Namdev, Eknath, Ram Dass, Tukaram are relevant even today in educating the masses. They are imparting energy to fight against superstition in each and every corner across the country. May they be compositions like Bharud (ÖæL¤ÇU) or Abhang (¥Ö´»), we get a great message of amity, love and brotherhood. We get the mantra to enable the society to fight against blind-faith through devotion and bhakti. These were the people who, at times restrained and corrected the society, even showed a mirror and ensured that old evil traditions get eradicated from the society and that people inculcated a culture of compassion, equality and righteousness. Our mother India is a land full of gems and treasures and the tradition of these great saints that adorned our land are at the same level as the great men who dedicated and sacrificed their lives for our Mother India. One such great man has been Lok Manya Tilak who has left a very deep impression on the hearts of a large number of Indians. We remember and pay our homage to Tilak ji on his birth anniversary on 23rd July and his death anniversary on 1st August. Lokmanya Tilak was full of courage and self-confidence. He had the courage to show a mirror to the British about their wrong doings. The British were so afraid of Lok Manya Tilak that they tried to charge him of sedition thrice in two decades; this is no small thing. I want to narrate an interesting incident to the countrymen which is connected with Lokmanya Tilak and his statue in Ahmedabad. When in October 1916, Lokmanya Tilak ji came to Ahmedabad, more than 40,000 people at that time gave him a welcome and during that very visit, Sardar Vallabh Bhai Patel had a chance to talk to him. Sardar Vallabh Bhai Patel was greatly impressed by Lokmanya Tilakji. When on August 1 1920, Lokmanya Tilakji passed away, Patel ji had decided then itself that he would build his statue in Ahmedabad. Sardar Vallabh Bhai Patel was elected the Mayor of Ahmedabad municipal corporation and he immediately selected Victoria Garden as a venue for Lokmanya Tilak's memorial and this was the very Victoria Garden which was named after the British Queen. The British were naturally not happy with this and the collector continually kept denying permission. But Sardar Saheb was also Sardar Saheb after all, he was persistent and had remarked that he might have to give up on his post but Lokmanya Tilakji's statue would certainly be built there. Finally, the statue got built and Sardar Saheb got it unveiled by none other than Mahatma Gandhi on 28th February, 1929; and the most interesting point is that during that inaugural ceremony revered Bapuji said that with the coming of Sardar Patel, Ahmedabad Municipal Corpor-ation has not only got a man but it has got the strength on the basis of which, building the statue of Tilakji has become possible. And my dear countrymen, the speciality about this statue is that this is a rare statue of Tilakji in which he is sitting in a chair and in this "Swaraj is our birthright" ("Swaraj Hamara Janma Sidhha Adhikar Hai") is inscribed right below Tilakji's statue. And this all happened during the period of British rule. Tradition of publicly celebrating Ganesh Utsav was also initiated with the efforts of Lok Manya Tilakji. The celebration of Ganesh Utsav publicly had become an effective medium in promoting a spirit of social awakening, integration, amity and equality among the masses besides projecting a sense of dedication and festivity in them. This was the period when there was a need for people to get united in the fight against the British; these festivals, by breaking the barriers of casteism and communalism served the purpose of uniting all. Such events gained more popularity with the passage of time. Thus, it becomes clear that our younger generations still care for the brave heroes of our ancient past, its heritage and history. Today, you can see Ganesh pandals in almost every street of various cities. All families in that street collectively organize these pandals. This is an excellent chance for our youth wherein they can learn qualities of leadership and organization and inculcate these in themselves. I will surely send your ideas and efforts to the people. Lokmanya Tilak evoked self- confidence amongst our countrymen and gave the slogan "Swaraj is our birth right and I shall have it." Today is the time to say that Good Governance is our birth right and we will have it. These lines inspired many young people like Ashfaq Ullah Khan, Bhagat Singh, Chandra-shekhar Azad and many others. Azad's courage and passion for freedom inspired the youth of the day. Chandrashekhar Azad put his life on the stake, but he never bowed in front of the foreign rule. It was my privilege and good fortune that I had the opportunity of going to Chandrasekhar Azad's native village of Alirajpur in Madhya Pradesh. I had the opportunity to pay homage in Chandrashekhar Azad Park in Allahabad, Chandrasekhar Azad Ji was a brave man who did not wish to die by the bullet of foreigners - he wished to fight for independence as a free man and if he had to die, he wished to remain a free man! This is what was so special about him. Once again, I bow and pay tributes to the two great sons of Bharat Mata - Lokmanya Tilakji and Chandrasekhar Azad ji. Just a few days ago, in the Junior Under-20 World Athletics Championship in Finland, India's brave daughter and a farmer’s daughter Hima Das made history by winning the gold medal in the 400-meter race event. Ekta Bhyan, another daughter of the country, in response to my letter, has emailed me from Indonesia, where she is now preparing for the Asian Games. Ekta in her e-mail writes - 'The most important moment in the life of any athlete is that when he or she holds the tricolor and I am proud that I could do that.' Ekta, we all are proud of you. You have brought glory to the Nation. Ekta has won the gold and bronze medals in World Para Athletics Grand Prix 2018 held in Tunisia. Her achievement is all the more special because she has made the imposing challenges in her life the key to her success. My dear countrymen, the month of August is significant because it is filled with historically important dates and festivals, but due to the weather sometimes sickness also enters the house. I wish all of you best wishes for good health, for this month of August imbued with the spirit of patriotism and for many festivals that have continued over centuries. 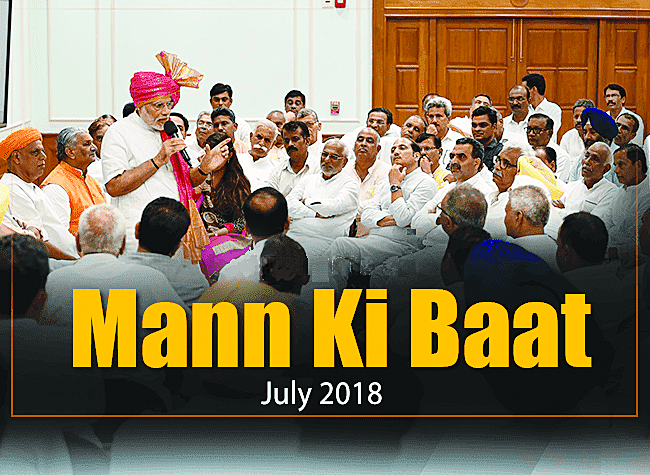 We will meet once again for 'Mann Ki Baat' next time.